Beautiful Adele is totally absent here. Red and black disappears Soft Autumns. 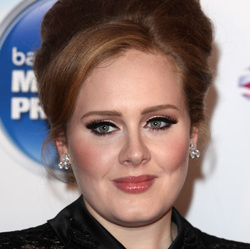 I can't find a good pic of Adele without heavy black eye makeup. It's part of her signature look, I suppose. But this cheek, lip and hair are all gentle Autumn with a touch of pink (which is a pretty good definition of Soft Autumn, I think.) Very real. Again, a Soft Autumn disappearing act. It's a picture of Mischa Barton's lips rather than a picture of beautiful Mischa. In her proper colors, Soft Autumn has a quiet majesty, an Earth Mother quality. Someone probably told you once that everyone can wear black. Get it out of your mind. Black is dead wrong for a lot of people - and particularly wrong for Soft Autumns. It turns them into ghosts. Beautiful Jennifer Ferrin is absent. Do you notice a pattern? The wrong colors make Soft Autumn invisible. It's as if her clothes emerged naturally from the colors of her body. This low-contrast, subtle look is not right for all seasons, but on Soft Autumn it is powerful. This is what Gisele Bundchen might wear if she didn't want anyone to know she was Gisele Bundchen. Of course, the beautiful bone structure is undeniable, but black washes out the subtle Soft Autumn coloring that makes her beautiful. Here she is draped in Soft Autumn-ish muted green. Squint your eyes, imagine those leaves are a gown, and see how perfectly that muddy green emphasizes everything that's beautiful about Gisele. Drew! This is Light Spring hair. It would be beautiful on Amy Poehler. Frankly, it's not nearly as bad on Soft Autumn as it would be on, say, most Winters. But it's still harsh. I mean, come one. How can you beat this? It's breathtaking. A word about the advertising you see on this site: I'm a working mom with small children, so the potential for a small bit of extra income is valuable to me. I hope your joy in visiting this site is not diminished.